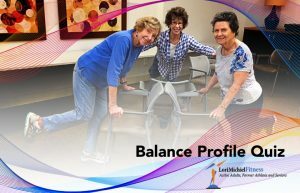 I suggest you take my simple balance profile quiz to better understand your potential risk for a fall. Please answer the following questions regarding your ability to balance. Your personalized results with helpful tips will be emailed to you.